Portraits are a popular photography subject and one that most hobbyist photographers want to improve at. If you can solve the problem of finding a willing subject, then this post has all the rest of the basic tips you will need! Join in! Portraiture is this week's challenge for the Boost Your Photography: 52 Weeks Challenge. It is said that the eyes are the window to the soul, and no where is that more true than in portrait photography. You cave "save" a poor photograph in many ways on your computer, but you cannot save a portrait if the focus is wrong. If you are shooting a portrait, regardless of whether that portrait is of a person, pet, or quick moving toddler, you need to have the eyes in focus. Set your camera options to manually choose an autofocus point. This means that the camera is using a set single focus point to determine where to focus. (In automatic autofocus point selection mode, your camera determines which of all of the available focus points to use when determining focus.) A single focus point gives you control over what your camera is using to set the focus. You should also pay attention to which autofocus mode your camera is using. In One Shot (Canon) or AF-S (autofocus single for Nikon), your camera will re-focus for each individual shot. If you have a constantly moving subject, you can use AI Servo (Canon) or AF-C (continuous-servo AF; Nikon), and your camera will track your moving subject and adjust the autofocus. Or, if you are expecting a mix of moving and still subjects, you can use AI Focus (Canon) or AF-A (auto-servo AF; Nikon), where your camera will adjust focus according to whether it detects a still or moving subject. The focus point for this self-portrait ended up well behind my eyes, leading to the out-of-focus blur. Now that your focus point mode is set, you can use the eyes themselves to set the focus. You can either use the center focus point and "focus and recompose" for shooting, or you can choose whichever focus point location works best for your portrait. (You can read more about how to focus and recompose in the post Focus on Focus.) Regardless of which method you choose, using the eyes guarantees that you have the most important part of the portrait in focus. Flattering light makes for flattering portraits. But what makes for flattering light? Consider the time of day, if you are shooting outdoors. Many photographers prefer the Golden Hour, that approximately an hour-long period just after sunrise or just before sunset, when the light from the sun has beautiful golden tones. Shooting during the Golden Hour will add a feeling of warmth and glow to both your subject and your background. Portraits work best with smooth, even lighting. Dappled or uneven lighting can make for harsh and unflattering portraits. Many portrait photographers prefer to shoot in full shade, so that an even light is falling on the subject. You can shoot portraits in full sun as well, but you need to be aware of how harsher lighting conditions and shadows affect your final look. Try to avoid shooting in any kind of mixed or dappled lighting situations - shooting under a sparsely leafy tree, for example, can create odd patterns of light and dark on your subject's face. You can also use a tool like a reflector for helping to balance out the lighting in your portrait. A reflector can be as simple as a thick piece of white foamcore board, used to bounce additional light on the shadowy side of a portrait. Or, you can invest in an inexpensive 5-in-1 reflector that provides five different reflective surface options. (Mine has white, black, gold, silver, and a diffuser.) Reflectors are useful tools and fold down into much smaller sizes for carrying and storage. A larger size, like those around 40" inches, is most useful for individual or small group portraits, as you can bounce a larger quantity of light than with a smaller version. You can read more details about how to use a reflector in the pinned article, Tip for Using a Reflector for Portraits. You may think that you need to be shooting in full manual to capture a truly great portrait, but the truth is that many portrait photographers do not shoot in manual mode. They shoot in Aperture Priority. If you are shooting an individual portrait, you can experiment with the very wide aperture values, like f/1.8 or so. Depending on your composition and focal length, you may find that you cannot keep the whole of your subject's face in focus, but as long as you nail the eyes, it can still look great. If you are shooting groups of people, you may need to narrow your aperture somewhat, perhaps to f/4 or f/5.6 depending on the numbers and whether they are arranging in a similar focal plane (like side-by-side rather than one behind the other). You may need to take some test shots and see if the depth of field (area of the photograph in focus) is appropriate for your given situation. If you realize that you shutter speed is becoming too slow, then you have a few options. You can raise your ISO value to capture more light (read the downsides in ISO Basics); you can use a wider aperture to capture more light; or you can add more light to your scene (reflectors or flash units) or move to a brighter location. You do not want a slow shutter speed and motion blur or subject blur to ruin your shot. Finally, one of the most important (and hardest to learn) lessons for portraiture is to watch the background. If you are shooting at a wide aperture, much of your background will become blur. But to achieve this look, you want your background as far as possible from your subject. 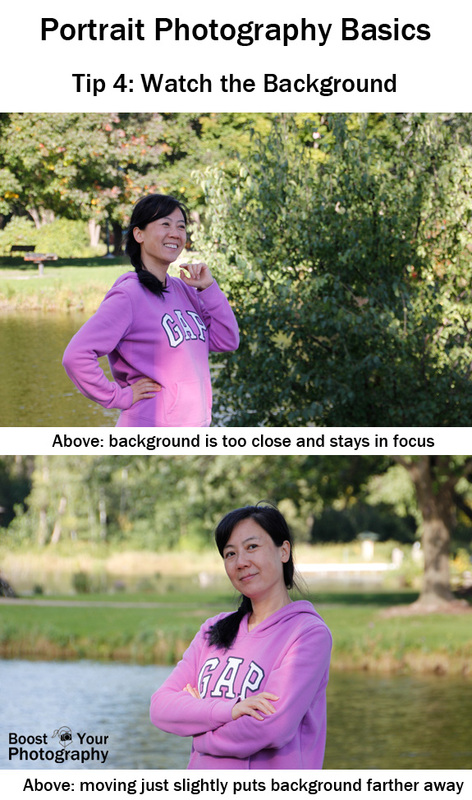 Also aim for even lighting in your background and between your background and your subject. If you are shooting your subject in shade to achieve even lighting, then you will want a similarly shady look to the background. If the background is in full sun instead, it will appear far too bright and overpowering in the final photograph or require a lot of post-processing effort. Likewise, a full sun subject against a shady background might appear overly bright or blown out. These four basic tips can help you make the most of your portrait photography opportunities. The next step is up to you. Find a willing subject (or enlist yourself - see Shoot a Successful Self-Portrait) and starting putting these ideas into practice. Ready for the next step? Check out these Top Tips for Photography Portraits and Posing and get ready to take your photographs to the next level! Share a link or a photograph in the comments below, or consider joining the BYP 52 Weeks Google+ Community to share your weekly photograph and see what others are capturing. This post is also linked up at Social Media Sunday, hosted by the IBA.